Category Archives: "Kavango and Zambesi"
Hakusembe River Lodge enjoys an idyllic situation 12km west of Rundu on the bank of the Okavango River, overlooking Angola to the north. The lodge offer an exceptional range of river based activities, even a picnic safari in a Watu - a dug-out canoe - to have a braai (barbecue) lunch on an Angolan island. A wonderful way to round off the day is to take a Champagne Sundowner Cruise, before enjoying Dinner under the stars, when you can indulge in the splendid cordon-bleu home cooking. The accommodation is mainly luxury air-conditioned double-bedded bungalows overlooking the river, all with en-suite shower facilities. In addition the lodge offers a romantic honeymoon suite with superb river views, or a floating chalet - to experience the life of the river at close quarters. Finally, the lodge offers a smart, well equipped campsite for those who prefer to cater for themselves. Taranga Safari Lodge is one of a very few luxury bush camp lodges in the Rundu-Kavango region. Intimate with only a few open fronted luxury riverbank tented cottages, situated amongst tall riverine trees, guests are offered ample opportunity to take in the sights and sounds of the African bush with views across the river into the nearby flood plains and during season the lily covered wetlands. There are daily guided river safaris taking you out for an adventure; an early sunrise cruise through the rising early morning river mist or a late afternoon sundowner or fly fishing. You may plan to go on a bushwalk, traditional village tour or choose to celebrate the end of a lazy day by spending memorable time at night around the fire pit stargazing.The large wooden decks offer a private and idyllic location for those wishing to unwind. You'll find a swimming pool at the main deck to keep everyone cool or allow you to just relax and enjoy the African sun. 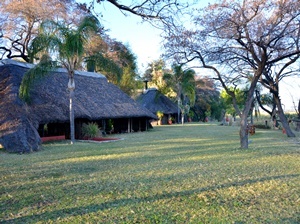 The Kaisosi River Lodge is situated 7 kms east of Rundu on the banks of the perennial Okavango River. Spectacular sunsets, friendly people, comfortable accommodation and fine cuisine make the Kaisosi River Lodge a must for all travelers. Guided fishing trips as well as river cruises on the Kavango River can be arranged. Accommodation consists of luxury thatched chalets, which are available as single, double or family units, all with bathrooms en suite. Mosquito nets are provided. The camping site caters for groups of campers and caravans, as well as for individuals and groups who require their own ablution facilities. Kaisosi has a luxurious swimming pool and bar area. 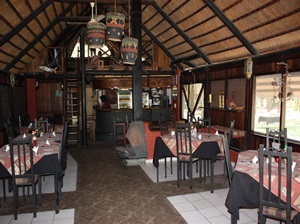 Delectable meals are served in our thatched restaurant. Guests are taken on sundowner cruises every evening and the lodge will be happy to arrange a floating breakfast on the river if required. 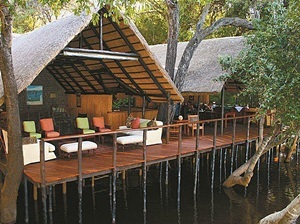 Conveniently situated 2km from Rundu in a secluded area on the banks of the Okavango River is Sarasungu River Lodge. 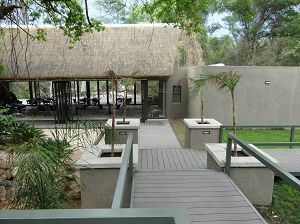 The thatched brick and reed bungalows with en-suite bathrooms are set amongst tall indigenous trees and rolling lawns. The clean whitewashed spacious 4 Bungalows all overlook the Kavango River. Tambuti is a small Lodge beautifully perched above the Kavango River overlooking the floodplain yet built in a way to operate all year round without getting wet feet. All Bungalows include, Telephone, TV and Satellite channels, Fridge, En-suite showers, double Queensize beds (with Back & Neck friendly mattress) Mosquito net and Mosquito tight screens at windows. The triple/luxury Bungalow has a shower and a bath. Air-condition is available for a small fee of N$ 50. A sparkling pool offers refreshment after a long days drive. Laundry service is available as well as on-site secure parking. 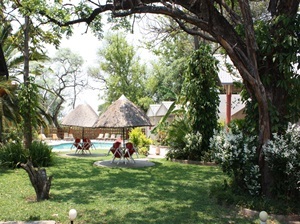 n'Kwazi lodge is situated only 21km east of Rundu and offers reasonable accommodation rates, environment friendly bungalows, scrumptious breakfasts, optional lunch packs and festive dinner buffets. Wi-Fi is available in the bar and lounge area. The Camping Site is adjacent to the lodge. Accommodation is tucked away along the Okavango River side, with optional guided Community Tours, Sundowner Cruises and Tribal Dance shows. The lodge offers 18 thatched roof bungalows, each with en-suite hot shower, washing basin and toilet, comfortable with two large single beds, linen and towels. Breakfast is included in the service. All overnight Guests in Bungalows and Camping Site, are welcome to enjoy free usage of our sparkling swimming pool, during summer. As owners and your hosts at River Dance, Tino and Karin share their passion for the magic of the river, their knowledge of the bush, and the spirit of generosity, an essential part of life in Namibia, with their guests. 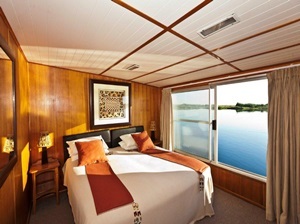 Peace and privacy are at the heart of RiverDance and its stunning, architecturally designed wooden and glass rooms. Nestled amongst hundreds of trees, spacious water front units are tastefully decorated with local linens, extra length beds and your choice of pillows for a most relaxing sleep. Private walkways lead to your own luxurious bathroom fitted with a bath & shower, biodegradable toiletries and plush bathrobes and towels. While reclining on the deck or soaking in the deep bath, the call of birds, frogs and little creatures that we came to love, will serve as background music. Deliciously prepared Namibian cuisine and only the best cuts of meat are served with locally sourced seasonal ingredients. You will be welcomed with song and dance and be wished a good rest by the kind people of the Kavango. The lodge has its our own orchard, a greenhouse, a supply of goat’s milk cheese, freshly caught fish, honey, wild fruits, roasted nuts, wild spinach, mahango and eggs which add to the luxury of life along the river. The exclusive camping sites offer privacy, a view and access to the river, and your own ablution facilities. 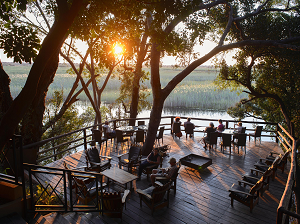 Divava Okavango Lodge & Spa is nestled amongst majestic trees on the banks of the Okavango River a few hundred meters from Popa Falls and 14km’s from the Mahango Game Reserve. The lodge is fondly referred to by the locals as Paradishi Ghomumbiru; (Little Paradise). 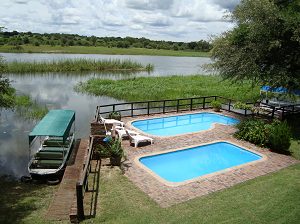 The Lodge offers an exquisite view over the Okavango River with excellent opportunities for bird watching. Divava Okavango Lodge and Spa offers 20 luxurious chalets, a bush bar, restaurant, swimming pool and a viewing deck overlooking the Okavango River. Boat cruises to the Popa Falls to view hippo and crocodiles and game-viewing trips to the Mahango Game Reserve. Nunda, the local Thimbukushu name given to the fruit of the Jackalberry tree, is situated on the Okavango River in the homeland of the Hambukushu tribe. Excellent birding, magical wildlife encounters coupled with great fishing opportunities as well as diverse cultural experiences will only make you want to return. 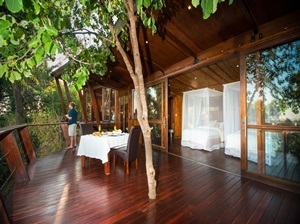 Each unit is set amongst huge indigenous trees and shrubs offering privacy and seclusion. Our accommodations includes seven large, tastefully furnished, twin bed, en-suite Meru tents, built on wooden decks as well as eight large thatched, twin bed en-suite bungalows. All units have covered decks which overlook the river. 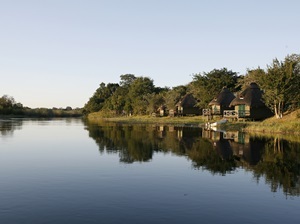 A further four thatched en-suite chalets, non river facing, complete the accommodations. Camping is undoubtedly one of the best on the river. Each site has a braai area, water and electrical points. Our ablutions, with indoor gardens, are immaculate and spacious true to your own home comforts. All sites are grassed, shaded and are in close proximity to the river. Purified drinking water is available. The lapa complex consists of an exquisitely furnished thatched restaurant, bar, curio shop, lounge, wine cellar and reception area. A large wooden deck overlooks the river and it is here where one can enjoy sundowners while watching spectacular sunsets, with an abundance of birdlife. Enjoy the splendour as snorting hippos make their way downstream to their feeding grounds. The restaurant offers a fine variety of Namibian cuisine complimented by a large selection of excellent wines from our wine cellar. We also have a large swimming pool, set amongst a magnificent grassed garden, in which to cool down. The comfortably-styled, thatched Mahangu Safari Lodge lies 22km south of the town of Divundu next to the Mahango National Park. The word "Mahangu" means "food of the local people". 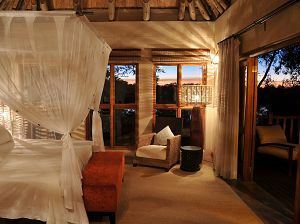 The Lodge comprises of 7 Bungalows, 4 Luxury Safari Tents and 3 guide bungalows with shared facilities. All units are air-conditioned and have 220V electricity 24/h. The Lodge offers a main Lapa, dining and lounge area, Bar and a sparkling Swimming pool with a picturesque view of the Okavango River as well as 2 Big Sunset decks on the front of the river. The Lodge offers beautiful campsites with power points next to the river. Campers are welcome to make use of the restaurant. Game Drives into the 2 National Parks next to us as well as the Popa Falls close by. Ndhovu Safari Lodge is situated just inside the western end of the Caprivi Strip, close to the Popa Falls on the western bank of the Okavango River, overlooking the Bwabwata National Park. The Lodge provides accommodation in luxury tents, all with en-suite shower facilities. 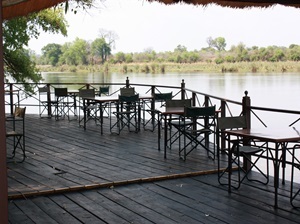 The lapa, housing the restaurant and bar, overlooks the riverbank which is often frequented by elephants and hippos. An exclusive campsite is also available. 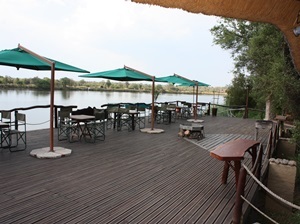 The Popa Falls Resort is situated on the banks of the mighty Kavango River. This resort is only 15kms from the Mahango Game Reserve, and is the perfect stop-over when travelling between the Khaudum and Mahango Game Reserves. Services include a restaurant, bar, kiosk, fire wood and water, and there is a nearby petrol station. The restaurant is open for breakfast, lunch and dinner. 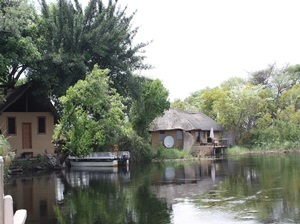 Accommodation is in the 10 thatched river cabins, set alongside the river. There are 4 beds in each unit. Facilities include communal ablution blocks and a field kitchen. An African river, a spectacular canopy of indigenous trees and vistas of the Kalahari grasslands in the Bwabwata National Park are the inheritance of the animals that roam here. 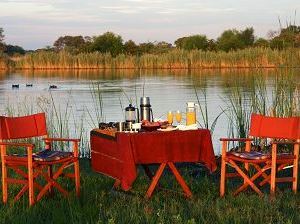 Situated in the Kwando River in northeastern Namibia, Susuwe Island Lodge offers just this. Lofty canopy viewing decks set amongst tall riverine trees overlook endless savannahs and glistening lily-studded wetlands. A firepit is embraced by a spacious lounge area and eclectic African art. Relaxation, privacy and comfort are paramount at Susuwe. A mouth-watering aroma, the clink of silver against china, a wine glass filled - these are the joys of African alfresco dining. Fresh air sharpens whetted appetites and a picnic laid out amidst tall whispering grasses in unchartered territory illuminates the experience. Six luxury suites, each with a wooden viewing platform and private plunge pool, is a haven of calm and respite, an airy dreaming space to recharge the senses. Professionally guided game drives are rewarded with special sightings of roaming elephant and buffalo, lechwe, lion, and leopard. A river cruise is preferable at sunrise or sunset and guided walks and night drives offer even closer insight into the intrigue of the African bush. At Shametu River Lodge we strive to create a relaxing and peaceful environment. Our private campsites lend themselves to privacy, peaceful surroundings and easy camping. No sharing of ablutions and you will be able to unpack your food crates and fridge into your private kitchenette. Our kitchenettes provide ample shelter during the rainy season for preparing meals. During the peak summer times it also provides an extra shaded area. Prepare your meals in your private kitchenette which has a tiled working surface. Electricity and water is on hand. No need to walk to fetch your water for preparation of your meals. You will have your own shower and toilet. There is no need to queue to enjoy your much needed shower to freshen up after your long and hot journey. No walking to showers or forgetting/losing your belongings, no stepping into wet and used showers, the shower will be clean and you will not run out of hot water. Fill in the form at the top–right and enquire today! Our lodge and campsite is in close proximity to the Botswana Mohembo border which is the gateway to the well-known Chobe Game Reserve in Botswana. We are just 80km from the Okavango Delta, where among other activities, you can drift on the delta waters in a Mokoro canoe(propelled by your own guide). The Mahangu Game Reserve which forms part of the Mbawatu Tranfrontier park and is only a 15 minute drive from our camp. At the lodge we have a coffee shop where you are able to enjoy delightful variations of light meals from breakfast up to 3pm and good imported coffee served with delicious cakes and tarts baked by experienced bakers. While you visit us, order a picnic basket from our kitchen and spend the day meandering along in the Mahangu Game Reserve searching for leopard, lion, buffalo, roan antelope, the shy bushbuck, warthog, monkeys, baboons, elephant, crocodiles, hippo and certainly not last on the list, a variety of bird life. 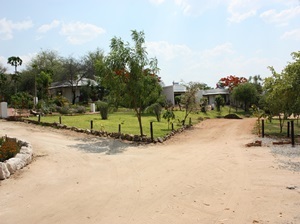 The lodge is situated 24km south of Kongola in Zambesi. A luxurious bushlodge offering 27 luxury bungalows with bath. All bungalowas are equipped with moskito nets. The lodge boats a small pool, sundowner deck, bar, curio shop as well as a buffet restaurant. 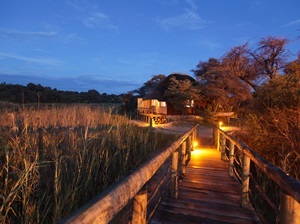 The lodge is situated on the banks of the Kwando River, looking onto the bathing area of the hippos that plunge here peacefully during the day. The area counts up to 300 different birdspecies. Boatcruises and fishing trips on the Kwando as well as game drives in Bwabwata National Park are the preferred activities of the guests. A 4km hiking trail introduces you to the rich birdlife as well as the splendid flora. Further attractions of this are are the Mudumo and Mamili National Park as well as the traditionell Lizauli-Village and Mashi-Centre for arts and crafts. Camp Kwando offers different accommodation. The Island Tents have two beds each and are equipped with a mosquito net, built on poles with a terrace overlooking the river. Furthermore there are 3 large Bungalows that are built on poles and on higher ground; made of wood canvas and thatched roofs. 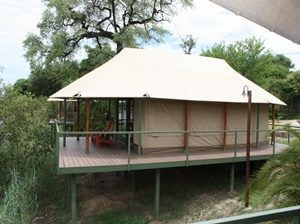 They are conveniently placed in the middle of the trees, allowing for an incredible view on the Botswana plains. Each Bungalow has a large bedroom, stylish furnished, a large en-suite bathroom as well as an expanding terrace. The Campsites are situated between the main building and the island. Its surface is covered with lawn and overhanging trees, allowing for shade. There are ablution facilities as well as areas to do laundry. The restaurant and bar are open for all guests staying there. 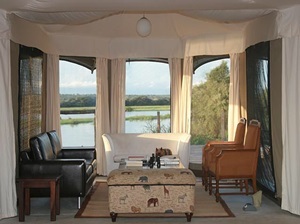 The dining room opens to the River offering wonderful views of the hippos and crocodiles passing by. At the confluence of the Chobe and Zambezi Rivers lies Impalila Island, which is also the peculiar meeting place of four African countries, namely: Namibia, Botswana, Zambia and Zimbabwe. This phenomenon is the only one of its kind in the world and it is within this unique geographic area that The Ichobezi River Lodges operate. Whether you want to marvel at the animals and birds; try your hand at fishing or simply meander along the breathtaking waterways of the area, this remarkable piece of Africa will capture your hearts and delight your senses. Beautiful Meru Safari tents nestled underneath the Jackalberry trees provide luxury accommodation with en-suite bathrooms and their own private balconies overlooking the Chobe River. The main lodge buildings are built with relaxation in mind and the attention to detail, peaceful atmosphere and outstanding cuisine are all part of the Ichingo Chobe River Lodge experience. Complete indulgence and ultimate luxury are experienced when you board one of our beautiful Ichobezi Safariboats and cruise the waterways of the Chobe and Zambezi Rivers. Both the Ichobezi Moli and her sister the Ichobezi Mukwae have made this unique area their own and guests on board are privy to a very special travelling experience that promises an ever changing view of the African landscape as it unfolds around you. At 18 metres long, the Ichobezi Safariboats offer space, comfort and first-class service. The professional crew is always on hand to expertly navigate the river, share their specialist knowledge, prepare exceptional meals and to ensure that your every daydream is indulged. Each Safariboat has four beautifully appointed cabins, each with en-suite bathrooms and a large picture window that will make you feel as though you are a part of your surroundings. A large entertainment deck with lounge, bar, dining area and sun deck with plunge pool all lend themselves to complete relaxation and provide the opportunity to view this unique wetland destination in a completely new and exhilarating way. Several smaller `tender` boats accompany each of the Ichobezi Safariboats, allowing you to tailor make your holiday with us. Accommodation comprises 27 en-suite rooms overlooking the garden and pool area, with restaurant and bar facilities which are available daily. Conference facilities for 30 to 100 guests are available, with standard equipment.Leisure facilities on-site include a swimming pool, boat cruises and fishing.